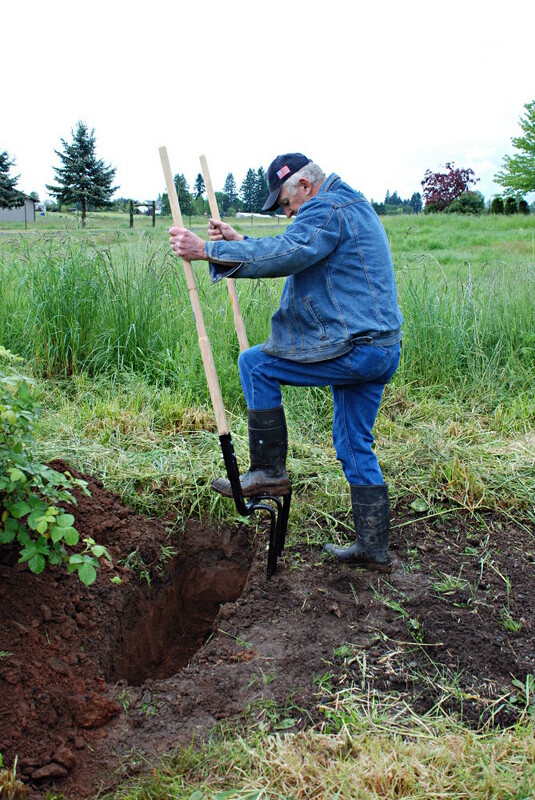 A Two-Handed Fork For Deeply Loosening Soil Without Inverting It. Read our tips on choosing a broadfork. 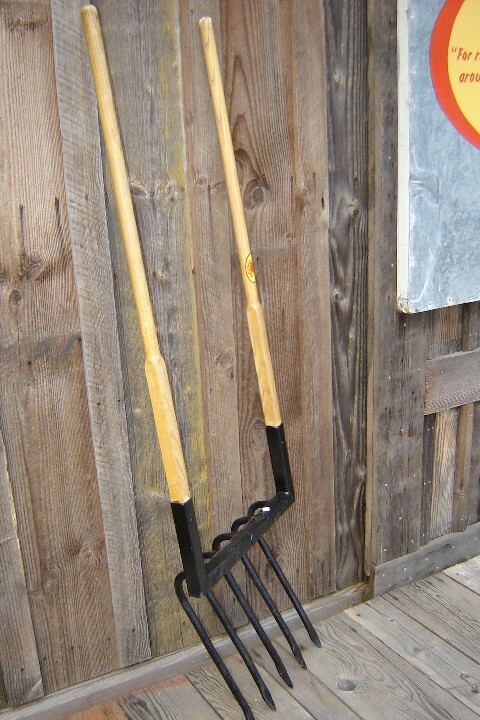 Broadforks are two handled forks with long widely spaced tines. They are used to loosen soil deeply without inverting it. Doing so maintains the existing soil structure and minimizes disruption of bacterial life while providing aeration that enhances water and nutrient penetration, root spread. It also serves to counteract the compaction caused by water, gravity and other causes. 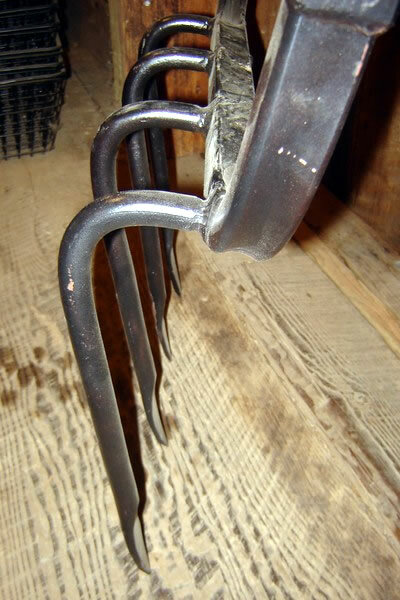 To wield a broadfork you force the tines straight down into the earth while holding the handles at arms length. You then pull the handles back and rock them breaking, loosening and crumbling the soil. As with all spading, you take small bites. Spits should be about four inches thick for average soil, thinner for heavy ones and never thicker than six inches. Taking large bites with these tools makes them exhausting to use and increases the chance for splayed tines. Broadforks typically have five to seven tines ranging from 12 to 18 inches in length. They appear under several names including U-bar digger, grelinette, garden digger, deep digger and two-handed fork. Our broadforks differ from others in that the tines have forged spade shaped tips that penetrate compacted soils more easily than the usual chisel points of other tools. The tines exit the cross bar horizontally and then bend downward. That allows them to slightly lift the soil as you pull back. 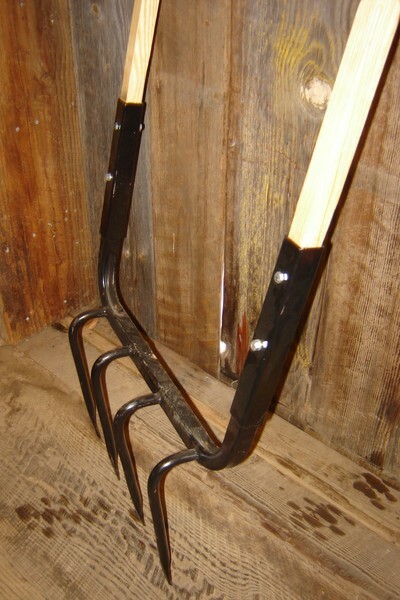 The broadfork pictured is a four tine model. It has 14-inch tines. 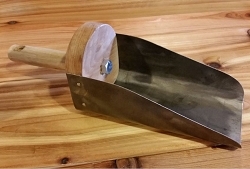 The ash handles are 48 inches long. Overall length is 67 inches. Because we build these forks to order you may specify the number of tines and their length. The price above is for the tool shown. The price for your tool will vary with your specifications. Please expect a 2-3 weeks lead time to give us time to make our broadforks to order. The size, shape, and weight of this item means we must charge an additional $20 shipping fee to our flat rate shipping rate to accommodate for the actual cost of shipping it. It will ship in 2 separate boxes, one for the metal fork and one containing handles and hardware needed for assembly.